The last bastion in Cheltenham offering high quality menswear and truly exceptional service. In the sleepy Georgian town of Cheltenham there lies a secret hideaway, tucked away behind the main drag of ladies-wear shops, Cafes and Bars. It’s known as James of Montpellier and it’s a place for men to step away from the world they know into an alternative, warmer and more understanding universe. One filled with tempting goodies, laughs and like-minded people, it’s a world that provides those who enter a strange warmth and glow. The keepers of this other worldly space are none other than the mystic James of Montpellier Triad, each of the three arrived from a different corner of the British Isles, thrown together by a cruel twist of fate they have found themselves burdened with a great and heavy task set before them. To offer men and womenfolk the highest level of customer service whilst smartening up, enthusing and entertaining them. It is an endless and unforgiving task, so tough and thankless that many worthy and hardened shopkeepers who did all they could to try and achieve this most impossible of jobs, eventually fled the borough of Cheltenham in various states of distress. Leaving James of Montpellier and the mystic Triad as the last bastion of high quality menswear and exceptional service in Cheltenham. To look at the Trio, it seems clear they have arrived from far and wide, for at first glance one would assume they’ve come together from three different worlds, physically, it could safely be said they have absolutely nothing in common. Firstly, there is Graham “Nick Nack” Ellis, the ageing, portly founding father, fuelled by bags of man-made cheese snacks and full bodied red wines he will leave no stone unturned when it comes to luring in new patrons. Using his vast experience and trained eye, along with plenty of sarcasm and quick wit he can and will transform even the most unsuspecting of patrons into an unrecognisably well dressed, confident and dapper individual. Then we have, Richard “baguette” Dare, the Jedi in training, towering over the rotund Nick Nack, to look at he appears to be a complete opposite (it’s been said there is more meat on JP McCoys Whip) However, after a quick interaction it becomes obvious he shares the same mystic powers as Nick Nack, selecting garments that perfectly suit those who enter, coupled with a dry and often sarcastic humour. He makes unsuspecting patrons feel quickly at ease in his presence whilst offering up untold goodies and laughs. The final part of this Triad is Helen “Joan the Wad” Ashley, she may appear to be the quiet one but beneath the surface she has many hidden talents (of which cooking is not one). She specialises in the dark arts of temptation and black magic. Her calm and even disposition will immediately soften and sooth even the most resistant of menfolk and before you know it they’ll be dressed in perfectly suited clothing and transformed before their very eyes. A word of warning though, one must never accept edible perishables from her bony hands, even those known for their mighty constitution will be left wriggling and writhing in pained agony within minutes. To offer an incredibly high quality range of clothing, shoes and accessories with an incomparably high level of customer service. It is a James of Montpellier guarantee that everyone leaving this unique world will be happier, effortlessly more stylish and certainly a lot more appealing to the women folk than when they first walked through the doors. 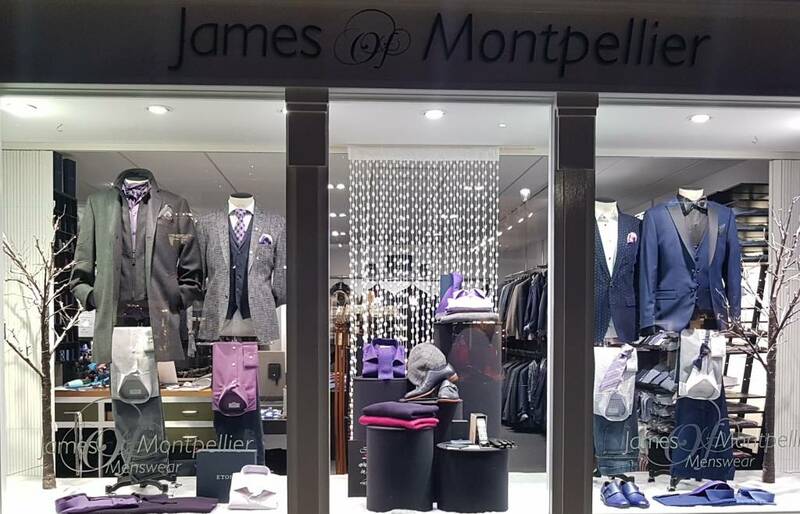 So, if you’re bored with the usual standard high street shops and crave a little more attention, customer service and need a quality gift or two for your loved ones, it could well be worth you paying a visit to see the James of Montpellier Triad…..we’re very confident you wont regret it!